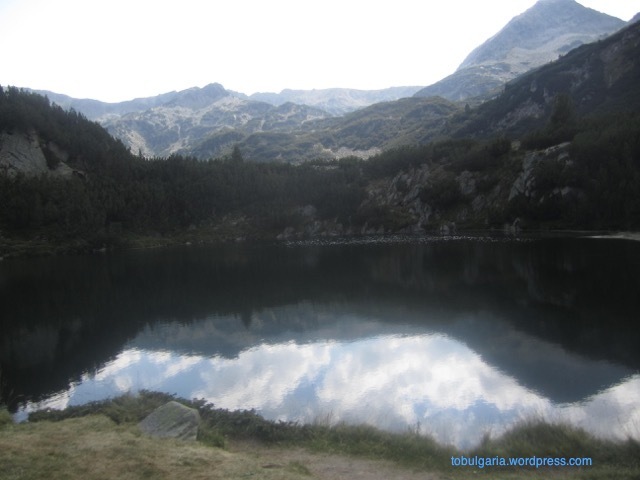 Bankso is due south of Sofia, but with a car you must curve your way west of the Vitosha and Rila mountains. It’s best known for skiing, but we like it year round. Our favorite place to eat and hang out is the Dedo Pene kruchma and inn. 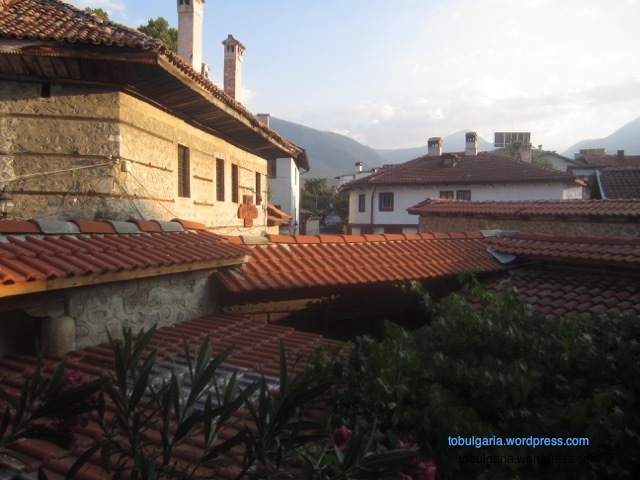 Kruchma is perhaps best translated as an informal and homey cross between a tavern and a restaurant. Originally opened in 1820, the family was able to get the property restituted after 1989 and it reopened in January 1991. The current patriarch long ago discarded his real name for that of the kruchma’s founder. Today’s Dedo Pene is not a tall man or a fat man, but he exudes bigness. He has the large, strong hands of someone who has done manual labor, close-cropped white hair, and hearty appetites. When a doctor asked him if he drank, he declared, “Doctor, I drink wine like water.” But, he pointed out, it’s his own red wine and what harm could come from that. There are multiple ways to enter Dedo Pene’s: the kruchma front, the rear double wood doors that lead to the rooms, a small side door that leads to a large space with sheepskins drying overhead. Somewhere en route from the inn’s ground floor to the ground floor kruchma on the other side is Dedo Pene’s workroom. There he can create and repair on an old Singer sewing machine the upholstery and rugs made from the sheepskins. The entire interior at Dedo Pene’s is something of a maze and as many times as I’ve been there I am completely unable to discern the floor plan. Large wooden signs with raised block lettering of the kind seen in American “Ye Olde Ice-Cream Shoppe” signboards announce the kruchma, menu, and garden seating. A small table and stools made out of tree trunks complete the “authentic” made-for-tourist look. But inside is a style that can only be described as authentic made-by-Dedo Pene, he himself. Passing through a wood door, you immediately step down a stone step to meet a set of swinging wood doors that mark the true entrance to the kruchma. The cash register and kitchen entrance are to the immediate right and three main seating areas at various levels are full of wooden tables covered with red and black-checked tablecloths. An enormous fireplace topped by a rifle and a rack of deer antlers commands the focus of the largest seating area. It’s a working fireplace, used to roast meats as ordered but also an integral part of the heating system. The walls are covered with things that Dedo Pene took an interest in, collected, bought, received as gifts from customers and friends in Bulgaria and abroad. A listing of it all could fill a catalog. A sampling: an old accordion hangs next to antique tools and a black-and-white ancestral photo. On the window ledge made deep by walls over a foot thick, there is an antique home movie projector, a classic typewriter using the Latin alphabet, and a Russian samovar. From the ceiling hangs a line of more than 20 animal bells—from small ones for goats to large ones for cows—frequently struck from one end to the other in a cacophonous call for attention or to celebrate someone’s arrival. Dented tin pan produce scales dangle from above as well as a hook scale that Dedo Peno allowed the children to hang from to test their strength, making suitable impressed sorts of noises that allowed them to strut off with superhero pride. Before we came back to DC, my husband presented Dedo Peno with a photograph he had taken of him. 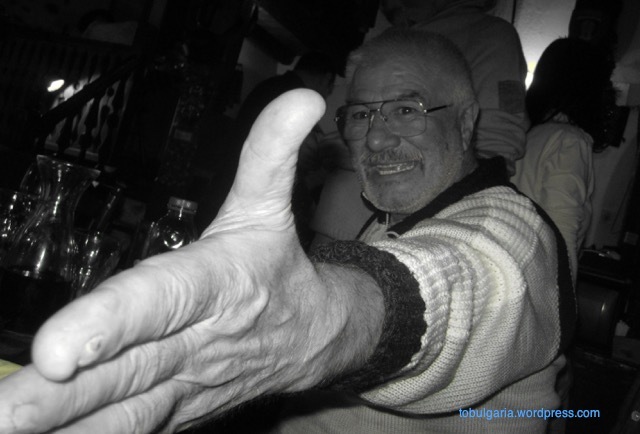 Black and white, with Dedo Pene’s large hand thrust forward toward the camera so that even the whorls on his fingertips are clearly visible, the photo was added to the great mix of items that make up the main indoor area of the kruchma. We can’t imagine staying anywhere else. The rooms couldn’t be more charming, with wonderful alcoves and balconies and amazing views of the Pirin Mountains. Dedo Pene and his family made us feel at home and the kids felt free to run around. Hiking with friends in the Pirin Mountains south and west of Bansko, the children lingered behind collecting wild raspberries and throwing carefully selected rocks and pinecones. Eventually, we made it to the Baikusheva Mura, at more than 1300 years old one of the oldest trees in the world. The roots of this fir snake on top of and through the large flat rocks surrounding a trunk that would take nearly all of us hand-in-hand to reach around. We continued past the Vihren Hostel, which seems not to have received much attention or maintenance since its 1980s heyday. The path grew rockier, the grass sparser, and the air cooler as we climbed. Less than an hour later, we reached our hiking goal. Okoto, The Eye, is a small, almost perfectly round lake. Part of the lake’s curve is bordered by a sheer, often bare rock face and part by densely growing trees. But perhaps half of Okoto’s curve is surrounded by a gentle slope covered with grass. 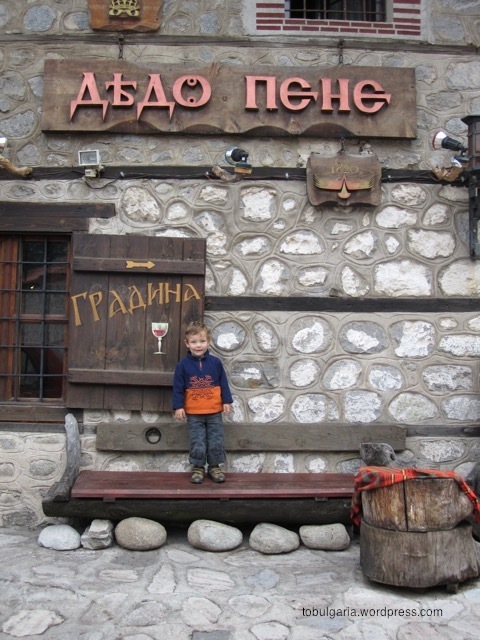 Back in old town Bansko, we naturally wound up at Dedo Pene’s for dinner. 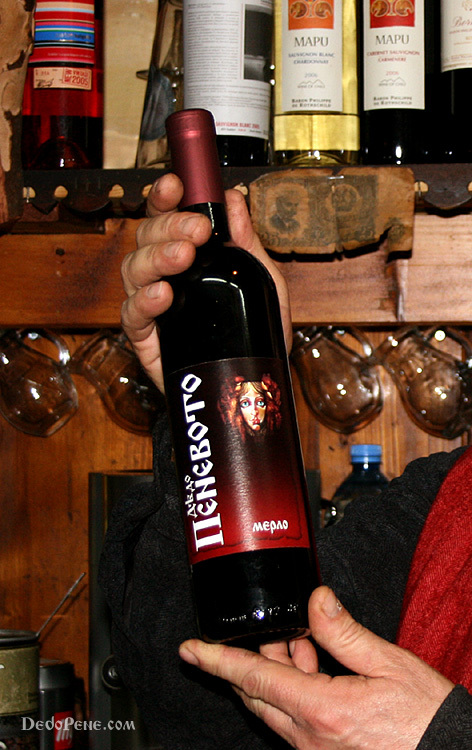 Very often at Dedo Pene kruchma, a group of musicians comes in to play traditional folk music. These are excellent musicians and one really shouldn’t complain, but no conversation can be had while six or seven men are playing the accordion, clarinet, violin, etc. and singing at full volume precisely behind your chair. But on this evening, as Dedo Pene was sitting with us and encouraging us to eat while the food was hot, he saw a group of young families enter with six children between them. This together with our group’s five children pleased him enormously. “It’s a whole kindergarten!” he cried, and he called to the musicians to play a “children’s horo.” Taking them by the hand, he began dancing with them, instructing them on the steps. The musicians stayed to play in honor of various people at our table—a song titled with one woman’s name, another a favorite of Dedo Pene and in which he joined in singing with an admirably powerful voice. It was our last night of this little vacation and we regretfully left shortly just before midnight, as always a memorable evening in Bansko.